A combination square is a great and valuable addition to any woodworking, metal or mason workshop. This tool will help you make accurate and precise square cuts for your projects. Remember that you don’t have to be a pro to construct nicely finished structures. As long as you are a dedicated craftsman, quality, accuracy, and precision should be your driving force. With that said, let’s look at what makes a combination square, how to identify the best of this tool and also reviews of some of its best models in the market. What is a Combination Square? 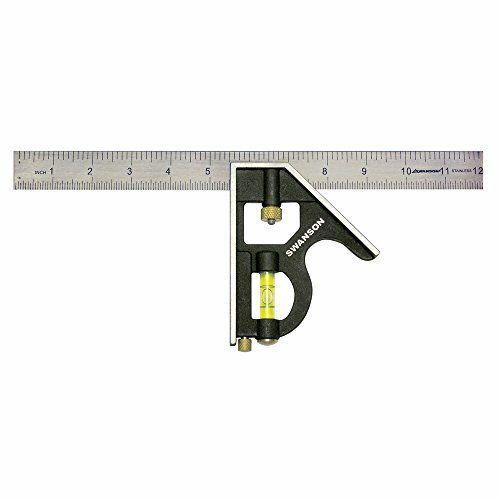 Like we’ve mentioned above, a combination square﻿﻿ is a measuring and marking tool. 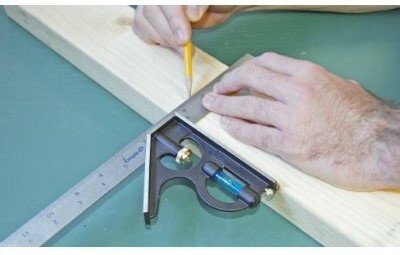 It is majorly used to mark right angles when making square cuts, checking internal and external right angles and marking right angled miters. Of all marking and testing tools, it is the most versatile one; although it can be quite challenging to use if you are not used to. This tool can also be used in various other applications e.g. it can be used as a depth gauge for mortises. Combination squares are made of steel, and the structure consists of a ruler and a head (sliding square). 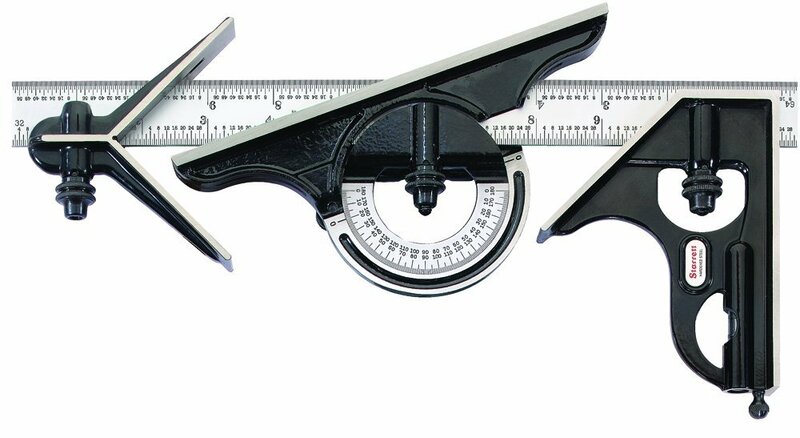 Just loosen the bolt to slide the head up and down the ruler. To fix the square head in place, just tighten the bolt again. Some of this tool are designed with an optional protractor head while other also have a 3rd attachment known as the center head. In this section, we will discuss the various applications of the combination square and the specialty of each head attachment. Use this as a guide to help you choose the best features and also learn how to use each one of them. A basic combination square usually has a level in the square head, if you come across one that lacks a level then move on to the next item. Why? Because the level is very﻿ useful in woodworking and if you go with a tool that doesn’t have one, then you will miss out on its very significant uses. Another significant feature is the 45° angle feature, although you will find some squares that have 90° angle feature which isn’t that useful. The scriber is also a mother feature to look out for in a combination square. It is a small rod that is sharpened to a point and is used to cut guidelines in wood projects. If you want a more professional and versatile ﻿﻿﻿﻿tool, then an optional protractor head is a good consideration to make. 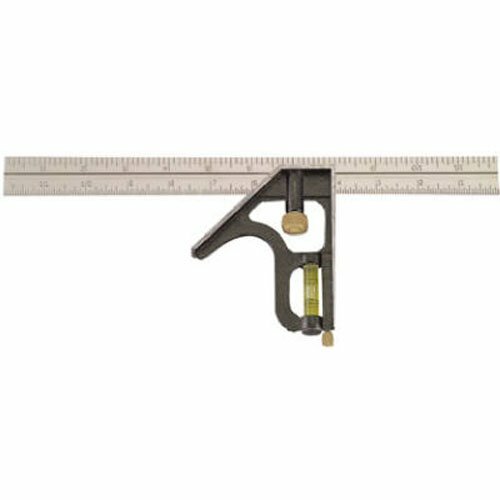 This one can measure a variety of angles which enable you to create more precise and accurate angles in wood. If you are going for a protractor head, choose one with level. The other optional piece we mentioned was the center head. This one is used in determining the center of a circular project like the center of a dowel or a plate. Any round project pieces need to be measured on a center head to determine the most central point of the project. Using the center head is not in any form complicated. You just need to place the circular edge onto the piece and mark a line. Repeat this from the other side of the material you are working on and mark another line. The point where the two lines intersect is the exact center of the woodworking ﻿﻿﻿piece. Once you have established your type of application and the correct attachment you want to your project it becomes easier to choose a tool that will enable you to mark and test wood for your projects. Determining the application only is however not enough, you should also consider the size of the tool. Remember that size will go by the space and size of job you are doing. Therefore, buy a big combination square if you will be handling larger projects and a smaller one for small projects. Keep in mind that the bigger the job or space, the bigger the tool needed. Besides, the price is also crucial to consider. Combination squares are priced differently depending on materials used, size, manufacturers, design and even the features presented in the tool. If you are on a tight budget, then choose from the low-end combination squares; these are not in actuality poor quality, they are just a bit economical with essential features. Otherwise, if you are a machinist or work at a professional level, then make a one-time investment of a high-end square with optional attachments and a wide array of features. Apart of application size and price, other things to consider should improve the accuracy of the tool, versatility, ease of use (if you can’t handle it before purchase then you won’t be able to after purchase) and durability. You should ensure that the materials used are durable of good quality and so should be any other additional features of the square. Are you a craftsman that is often involved in top accurate and high-endfinishings? If your answer is yes, you need a high quality professional tool. What I am trying to say is that this precision tool can be a great addition to your tool box that you will never regret buying. This Starrett C434-12-4R is not like any other combo square you will come across here. Instead, this is a top quality combination set that eliminates the needs of purchasing separate solid squares for various applications. It is a true definition of quality and efficiency as far as measuring tools are concerned. The first advantage of this instrument is its versatility. As mentioned earlier, it is a combination set, and it has all three attachments; a square head, center head, and protractor. This means that you can use this single set for a variety of applications. It simply reduces the burden of having to carry many tools to a site. Additionally, it will provide you with top accurate results both in accuracy and precision. With the clearly marked numerals, square edges, and 3 optional attachments, this set will help you minimize all possible errors and build ups that are usually visible late into the projects. Durability is also a factor that we can’t fail to mention in any Starrett set. The overall build features a satin chrome finish that makes it last for years without fading, corroding or rusting. Also, the build quality and configuration speak for itself. This is truly a top quality tool with undoubted durability. Last but not least, everything about this instrument is easy to use. The legibly engraved markings characterize its usability with fade protection, smooth movements, and an exceptionally flat ruler. This Starrett combination set is a high quality precision measuring tool that will provide you with long-lasting and dependable service. It will allow you to work with better accuracy and greater efficiency for top quality woodworking. In a short sentence, this tool is worth every penny. If you have been following our reviews and buying guides here closely, you will realize that Irwin is a brand that is commonly mentioned in most of our pieces. Why? This is because IRWIN is one of the best and top recognized power and hand tools manufacturers. For this combination square, I will say that the many positive reviews and ratings speak for itself. It is a small square that is just perfect for marking smaller woodworking projects. It is an overall excellent companion tool for woodworkers with affordable quality. Talking of features, this square is fully packed with all the necessary features needed for small woodwork projects. The features here are not just easy to use but are also of good quality and, very desirable. The most likable thing about this particular tool is its durability. It is made with a durable cast iron body and stainless steel blade that not only slides smoothly but is also tight, sturdy and rust proof. Buying this square by IRWIN will assure you of top quality and long lasting performance. Another good feature is the possibility to mark both 45° and 90° angles on wood. The best term to use is versatile. The two possible marking options make it a top versatile square model for woodworkers as well as machinists. Besides, this 1794469 square can also be used to transfer measurements in projects. The black precision etched scales on the ruler provide for an easy to read and use square measurement. The markings are well engraved and are very legible. Using it on wood despite its small size won’t be a challenge. Most customers complain about the accuracy of this square. The edges do not seem to be true and the angles as not as precise as they should be. All in all, this is the best affordable square you can purchase for your small workshop. It is effective for use in marking small boards and setting up smaller machines. For its price, the quality and functionality of this square is just unbeatable. This empire E250 is rated as one of the best level and square in the market currently. For the fact that it is made in the USA, customers find its quality and durability totally dependable. That aside, the square is reasonably priced which therefore makes it an excellent choice for both professionals and DIYers looking for an affordable, durable, and functional combination square. Like the IRWIN model mentioned above, this E250 Empire model square durability is unquestioned. It made with etched stainless steel blade that prevents numerals from fading away. And it also features a matte finish that prevents it from rusting or corroding thus assuring you of its long term use. For accuracy, this tool from the manufactures point of view is also quite accurate. The features present here are wholesome in terms of accuracy and precision for woodworking. This level and square utilizes the most accurate vials in world so to say. It is designed and engineered to deliver maximum accuracy and precision of up to .00050 inches when marking and measuring wood projects. It is the best easy to use combo squares you can buy. The self-aligning draw bit provides for a fast blade change and the ruler is also easy to read in all possible lighting. Moreover, this hand tool also features an easy to access scribe for creating guidelines. Based on the customers complains, the 45° angle is abit off. It is not the best choice tool if you will be marking miters. The ends of the ruler are not as square as they are supposed to be. It is overall light and not as sturdy. In comparison, the IRWIN model above is a better choice tools for quality woodworking. It has a heavy duty feel and is also very sturdy. Both tools are equally durable and are also reasonably priced. So if you want a dependable tool for basic woodworking, then this is it. 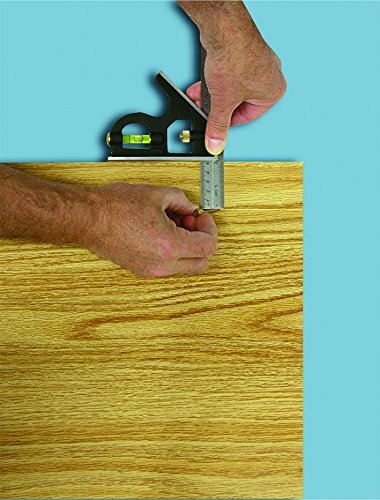 However, for marking miters look for one that provides better accuracy. This Swanson tool is the least expensive item in this list. It features an all metal body construction that makes it deserving as top 5 best combos for the money. If you are the budget conscious type but still a functional tool that can get the job done, you might want to consider this basic TC132 instrument. While most tools here are averagely priced, some have flaws that discredit them as a perfect tool one way or the other. This Swanson, on the other hand, is not necessarily perfect, but it is at least lower priced and gets the work done to satisfactory levels. With very little amount you can comfortably buy this Swanson square and get to enjoy its functionalities. Despite being the cheapest, this tool is made with good quality die cast zinc and brass bolts that provide you with long lasting, firm and accurate settings for measurements. The brass bolts are also quite sturdy and help you to lock it in place securely. Nothing causes much frustration like a tool that wobbles when you are trying to measure and mark projects. Not only does this valuable waste time, but it is also draining. Well, for its price one shouldn’t complain too much because at least it gets the job done to a better state than it would without a one. My advice is that buy this tool if you are pressed for cash, but if you can spare a few more bucks,then there are better quality models in the market like the IRWIN model above. While most of the reviews we have made here are recommended for woodworking, this Johnson square is best suited for DIYers and constructers. If you are into small home improvement projects and a few constructions here and there like framing, this particular square might work for you. However, for more complicated projects where accuracy is of top priority, this might not be the best choice. I hope you are not already discouraged by our brief description above. You might be impressed after reading this section. Well, to begin with, this is a 12 inch square. For carpentry, this is the best dimension to go for. 12 inch rulers are the most useful and versatile as they can extend a square line slightly above 10 ½ inches. Additionally it has a cast zinc head which is quite impressive as these are more reliable than those with non-metal constructions. They can be easily calibrated and they work best than most squares with non-metal constructions. The computer machined gauging edges are a plus for this Johnson level and tool since they add to its versatility for use in various applications as well as providing for greater accuracy in construction needs. And while most craftsmen prefer stainless steel blades, this one has a coated regular steel blade that works well in preventing the blade from corroding and rusting. Although the coat tends to chip off making the blade susceptible to dangers of rust and corrosion. It is designed with regular steel blade. The tool is not that durable as the ruler flexes easily. For its price, this is a basic practical tool that will work for measurements and approximating squares in constructions. It is however, the least choice for tool set up or for woodworking as it lacks the accuracy needed for these. 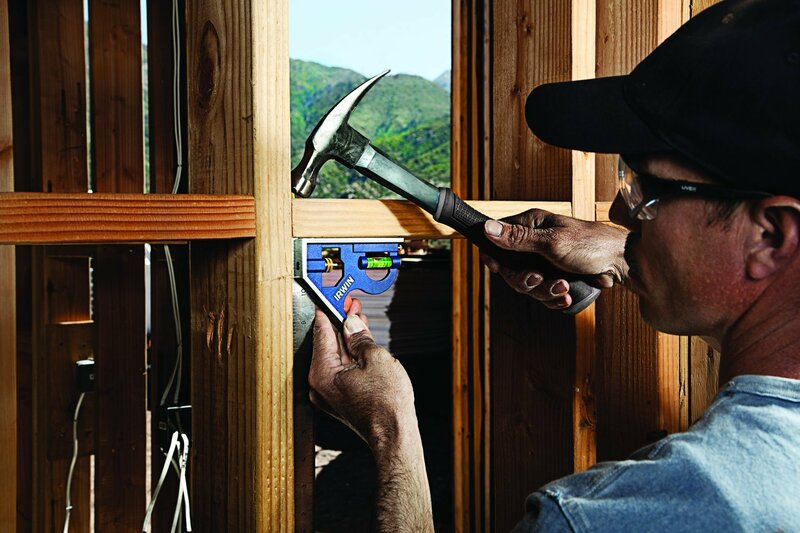 With all its versatility, the combination square should be a staple in your toolbox. It is a tool that you can actually keep and use for a long time that is why you need to choose it carefully. Use this article as a guide to choosing the best combination square and always strive to invest in the best of its quality.